Perennia hosted a workshop on Tuesday, May 17th, 2016 at the Wolfville Farmer’s Market. In attendance were some of Perennia’s summer students. Jonathan Bent, Tamara Dondi, and Jessica MacDonald have written up a brief overview of the morning’s discussion. Dale Overton, President of Overton Environmental Enterprises Inc. (OEE) situated in Manitoba, held a talk in Wolfville, NS outlining the science behind Eco-Tea. Eco Tea is actively aerated compost tea, infused with an organic blend of humic and fulvic acids, Atlantic kelp extract, complex carbohydrates and enzymes. Humic acid can be found in compost and acts as a chelating agent, which increases the availability of nutrients to plants and prevents nutrients from leaching. Eco-Tea is made from four different types of compost. To reduce the number of pathogens, the compost goes through a thermophilic stage where it is heated enough to work against the growth of pathogens. When making the compost it is essential that air (oxygen) is allowed to move through the pile because anaerobic conditions (no oxygen) favour the development of disease. The compost aims to support the growth of a complex microbial community which will outnumber pathogenic organisms. A broad definition of compost tea is that it is a liquid extract of compost. In general, compost tea contains nearly 20,000 different species of microorganisms. Similar to when making compost, the goal when brewing compost tea is to produce conditions in which beneficial microbes can grow. Other things can be added to the tea as well, such as grain meals (food for the microbes), minerals, and bio-stimulants. 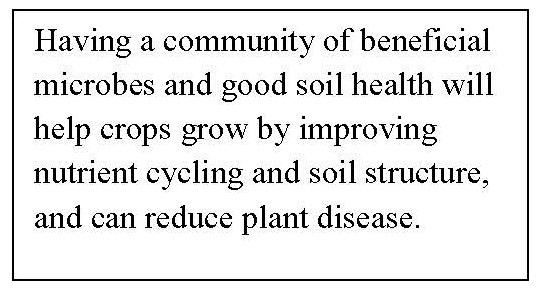 Bio-stimulants are not added to the compost until the end to allow enough time for the beneficial organisms to build a complex community. If a fungicide is being applied, Dale recommends waiting to spray the tea for 5 to 7 days to limit the detrimental effect of the fungicide on the beneficial microbes in the compost tea. Sprays should go on either before 10:00 am or after 6:00 pm using a field-jet nozzle, with no filters. For transplants, he recommends a 50:50 dilution in water.